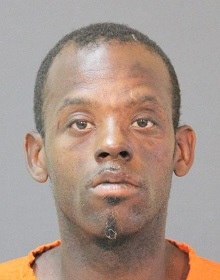 On June 19 at approximately 7:30 a.m. Calcasieu Parish Sheriff’s Office deputies were dispatched to a call at a local motel on Broad Street in Lake Charles in reference to a robbery. When deputies arrived they made contact with the motel owner who stated a man entered the business, walked into the kitchen and then approached the check-in counter. The man then reached over the counter and took an undisclosed amount of cash out the register drawer. The complainant stated as he was walking in the door the suspect exited the motel and fled the scene on foot. After further investigation detectives arrived on scene and spoke with several witnesses who stated the suspect was possibly still in the area. A CPSO K-9 arrived on scene and was able to locate the suspect, identified as Blason J. Pellerin, 41, Lafayette, LA, in a wooded area a short distance from the hotel. Pellerin was arrested and booked into the Calcasieu Correctional Center and charged with simple robbery; and theft less than $1,000. Judge Sharon Wilson set his bond at $12,500. CPSO Detective Chad Collins is the lead investigator on this case.